I am glad to report the CrunchBase team has showed interest in the analysis that I’ve published in my last post, the part 1 of this series. So much so that they have agreed to share with me the complete CrunchBase dataset: not just covering start-ups headquartered in the US (as publicly shared here) but in all corners of the world! Another way to measure the accuracy of the database is to look at the average time lag between a round occurring and its data entry in the database. Once again, the analysis shows a clear improvement in that respect, especially in the US and Europe. 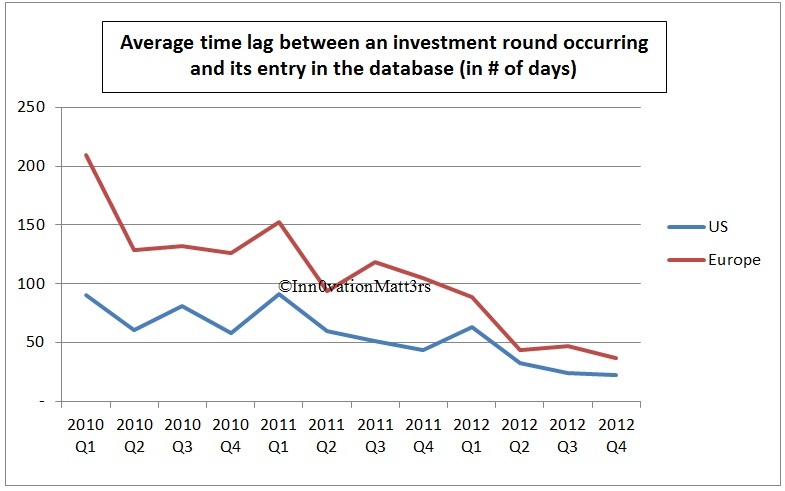 For all rounds of investment in the database that have occurred between Q1 2010 and Q4 2012, time lag drops significantly over time (c.75% reduction in the US and c.82% in Europe). The US remains the region where the dataset is the most “up-to-date”, with an average delay of 22 days between a round occurring and its data entry (vs. 37 days in Europe). 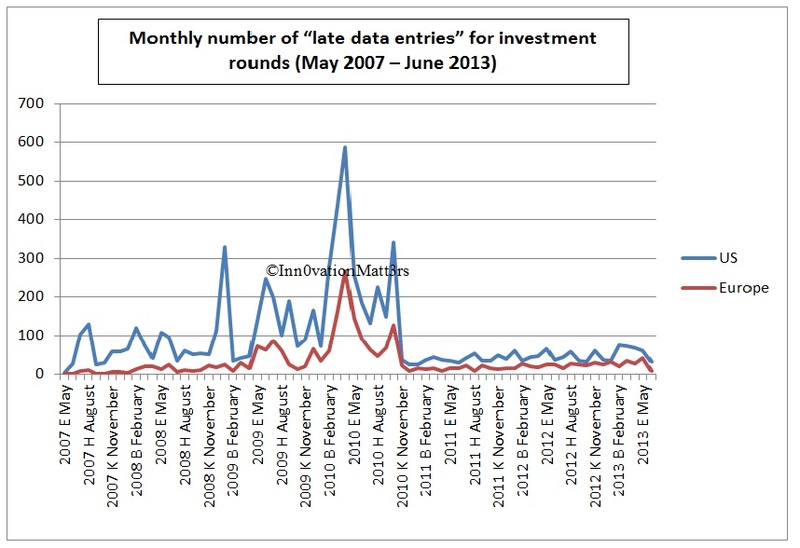 The above chart shows there was a significant peak in data entry activity around April 2010; this was probably caused by a concerted effort from the CrunchBase team to improve the historical accuracy of the dataset. 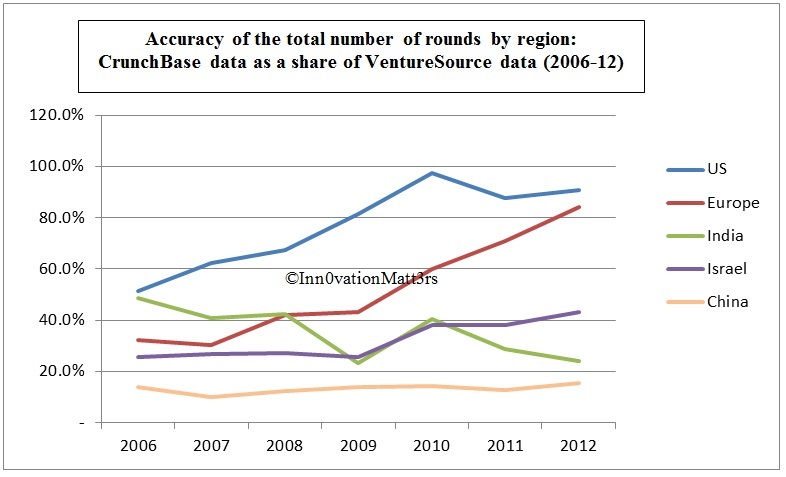 Whilst the CrunchBase dataset is clearly incomplete for 2007 data, its accuracy improves for more recent data. 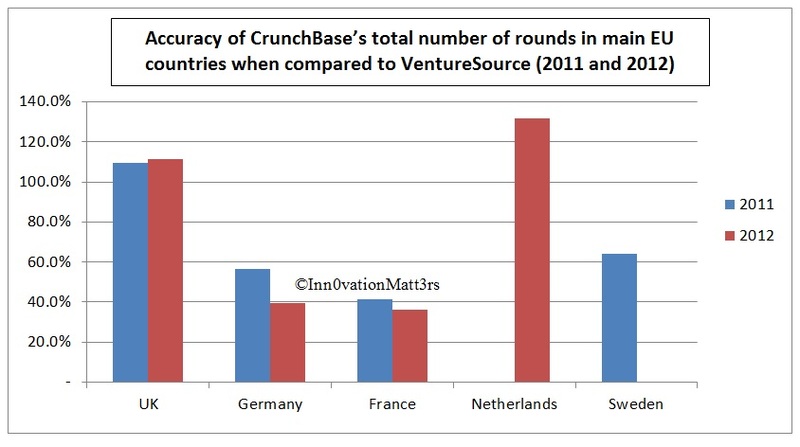 In fact, as of today CrunchBase may well be the most accurate database in the world when it comes to the Europe start-up scene (one has to keep in mind however that the strength of the database varies considerably by countries – for instance it is strong in the UK but weak in France). 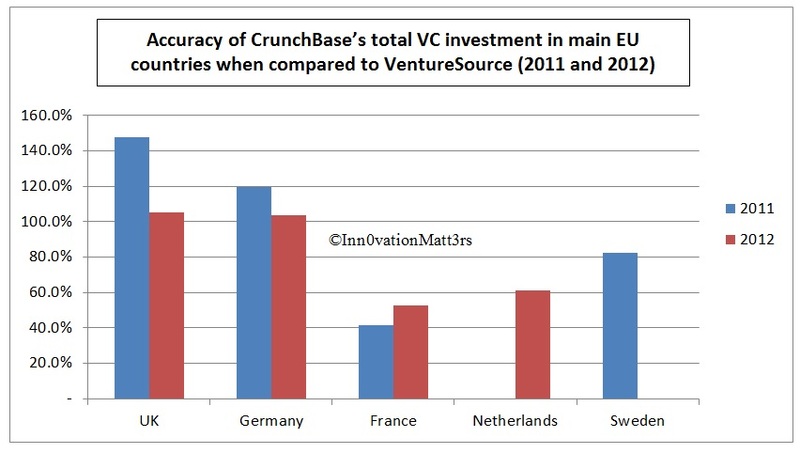 To conclude, whilst my analysis shows that there is room for improvement at a country level, the fact still remains that CrunchBase is already doing as good a job as any other existing database when it comes to keeping track of European VC investment activity. 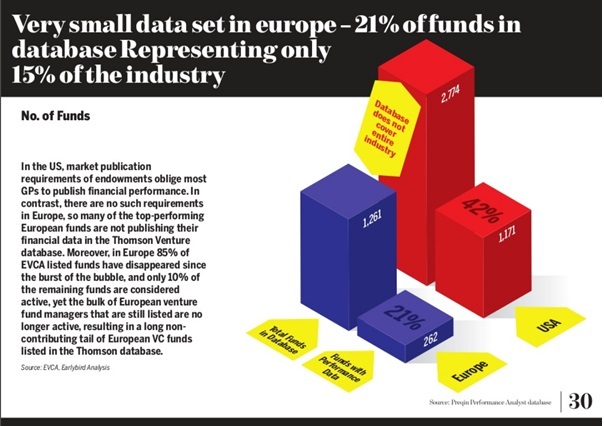 If CrunchBase were to actively launch and promote the CrunchBase Venture Programme in Europe, it would probably change CrunchBase into the uncontested #1 database for the European start-up eco-system. And the best thing about it? Unlike its competitors, CrunchBase is free! 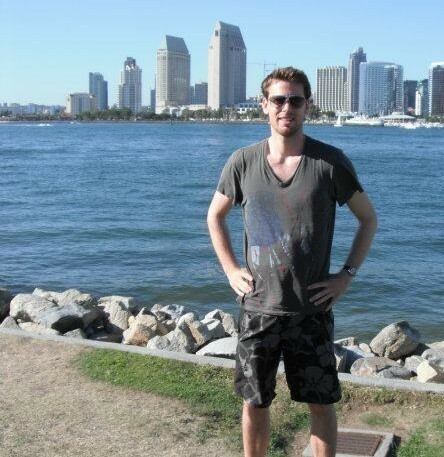 Posted on July 2, 2013 by inn0vationmatt3rs. This entry was posted in Uncategorized and tagged start ups. Bookmark the permalink.